Daniel's Farm and Greenhouses – The place to shop for all your garden and landscaping needs. WINTER! Don't forget about Daniel's Farm and Greenhouses in winter. Stop by and see our Christmas inventory. SPRING! Daniel's Farm and Greenhouse is buzzing in the springtime. Come by for a colorful and refreshing taste of spring. SUMMER! See what sales and flowers are blooming around Daniel's Farm and Greenhouses this summer. AUTUMN! Fall is a great time of year to stop by Daniel's Farm and Greenhouses. The color in your garden doesn't have to leave with summer! We are Open! Sundays, too! Pansies and Viola Are Here and ready to plant outside! Springs bulbs instock and ready to plant outside! Spring Trees and Shurbs are here and ready to plant. Spend some quality family time together and enjoy the beauty a tree provides! 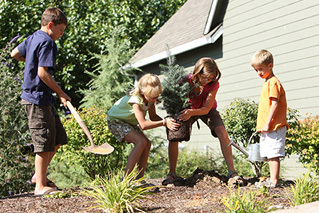 From ornamental to shade or evergreen, trees are the basic element for any landscape plan. Pick one out today! Custom Container Planting makes a great gift! 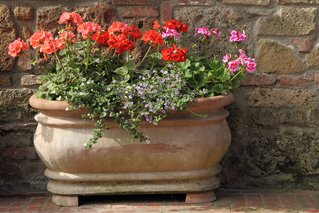 Simply bring in your pots and we will help you design the perfect combination container. We also plant them for you! Call today for details. The place to shop for every season. Daniel’s Farm and Greenhouses is a local family owned business serving the Saint Charles, Missouri area. At Daniel’s Farm and Greenhouses we believe the appearance of your home is very important. Your lawn & landscaping are the first thing people see when they visit your home. We believe that you’ll feel confident in our ability to meet all of your expectations. Our customers are always our first priority. In more than 1 acre of greenhouses Daniel’s Farm and Greenhouses has over 8,000 hanging baskets, hundreds of sun and shade perennials and over 100,000 pots of colorful annuals! Looking for trees and shrubs? We have hundreds to choose from. Daniel’s Farm and Greenhouses also offers locally grown herbs, vegetable and fruit plants. Don’t forget about us this winter! Stop by and see our Christmas inventory. 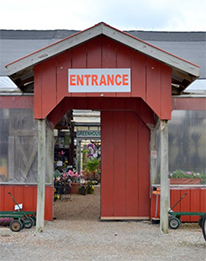 Located in the center of Saint Charles County, Daniel’s Farm and Greenhouses is the place to shop for all your garden and landscaping needs!